Boil wort adding hops and yeast nutrient as specified. Add honey after the boil. Ferment under 65 for a couple of days, then let heat up to about 70. Total fermenation time 2 weeks. Updated recipe for batch 3. Hoping to brew this weekend. Bought ingredients. Going to officially brew this weekend. Brew day today. Had the mash going at 4. Went back to bed and didn't get things started for the sparge until 7:30 or so. Temp started at 150 and ended around 140. Had to deal with a stuck sparge. About halfway through, no flow at all. Missing up the mash did nothing. Has to scoop into a grain bag inside the small pot. Pre-boil gravity was high 1.043. Diluted with .5 gallon water. Fermentation has been going well. Temperature fell to around 62 and has not risen much over the past 2 days, but things are going strong. Nice orange aroma coming out of the airlock. Going stronger. Beer temperature has risen to about 70. Bubbling pretty much stopped. Kraussen starting to fall. 70 degrees. Still a nice orange aroma from the air-lock. Took a gravity sample. 1.009 puts the abv at 5.4%. Lots of orange zest flavor. Should be a hit. Might keg Thursday. First taste from keg. Fantastic orange flavor on this beer. Just awesome. Could use more carbonation. Cloudy. Great beer. Keg blew. Been a good beer for awhile now. Day 1: 63 very active by the evening. Bought the ingredients today. Should brew it on Sunday. Hope it isn't too hot out. Brewed it up today. The weather was very HOT, but between the pre-chiller and soaking the carboy in ice, I got the wort down to a nice 64 degree pitching temperature. 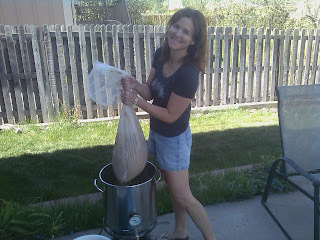 You can read about the brew day on my blog. Added blow off tube last night. Good thing, because there is considerable blow-off. Fermentation still going. Blow off tube is still in. I let the temperature rise to around 68 overnight so this should be finishing up the main fermentation soon. Kegged it up. Also filled up my 2 liter growler. Nice delicate wheat flavor with just a touch of orange peel and coriander. 1.007 FG makes it a 5.1% ABV beer. Had my first couple of pints. Perfect summer wheat. Just a touch of orange with the delicate wheat flavor. Really yummy. Don't tell the Beer Model I said this ... but this is a very nice beer. I think the keg is about done, which is good so we can make room for the Boo Berry Wheat. Well, the keg is done. I think today is the first day of autumn. How appropriate. Sparge with 1.87 gal of 168.0 F water. Mash Malts BIAB for 75 minutes. Use sparge water to rinse / steep the grain bag after the mash and then add to boil kettle. Batch prime with 4.5 oz table sugar. Carbonate at room temperature for 2 week and drink. Day 1 & 2: Active. Temp around 64 the whole time. Day 5: 68 just a bit of kraussen left. The Beer Model and I kegged this up today. Very good attenuation. Think if I make this again, might want to increase the mash temp. But then again, the sample tasted what I think an American Wheat should probably taste like. Coriander and orange very subtle, which is perfect. Am trying to force carbonate this to around 2.7 volumes, which means about 31lbs at about 68 degrees. Where did you get your bag for BIAB brewing? Did you make it or buy it and how big is it? I've been doing BIAB Mr. Beer size batches with paint strainer bags but figure I need something bigger for some upcoming 5 gallon batches. Thanks! Clint, I use a 24 x 36 "sparge bag" that I bought from one of my LHBS's. It fits perfectly in my 8 gallon pot. The guy at the shop and I spent quite awhile going through what he had before we found one that looked like it would be big enough, and he only had one, so I hope I don't have to replace this one. I do think most hard-core BIAB-ers make their own, and I don't think it would be that hard if you have access to a sewing machine. Had gas leak out of gas in poppet. Disassembled and reassembled. No leak now.Hope I did not cause problems. Had a few tiny samples. Very good, and seems a bunch like NB Summer Bright. Not sure about carbonation. Yes, this is a very nice summer beer. Brought up the keg of Summer Lovin to Breckenridge with the Beer Model's family. It was emptied early the first night. Nice beer. Might have to brew this again before the summer is up.